Longitude: 153 degrees 16.529 W.
Sea wave height: 0 ft.
Sea water temperature: 9.4 C.
Sea level pressure: 1003.9 mb. Today we have the exciting assignment of surveying the site of an 1860’s wreck of a Russian vessel. We’ll be making black and white images of the site of the wreck, giving archaeologists the depths of the whole area of wreckage. What makes this find so unusual, according to the Kodiak News, July 16, 2004, is that divers have already found a cylinder that spells out the name of the vessel “Kad’yak”. It is so rare to find an identifying object, that it happens in only about one out of a hundred sunken wreck findings. The Maritime Studies Program of Eastern Carolina University has a permit form the Alaska Department of Natural Resources, the National Science Foundation, and NOAA to do research on the site. They have sent down divers through the month of July and they have found a cannon, deck braces, a ballast pile, and three anchors. This has been identified as the oldest wreck ever found in Alaska waters. These samples all help to identify and date the wreck. After careful cleaning and preservation treatments, they will be put on display in various museums. Our survey will be a multi-beam swath survey, made from several of our launches, that will take several hours. We may not know much immediately from our survey, because all the data will need to be processed, cleaned and sent to the cartographers for charting. Perhaps we’ll read more about it in days to come in the newspapers or scientific journals. I was excited to know that we were traveling through Whale Pass today and when I went out to the flying bridge to get a good look at the area, I saw a whale, quite near the ship. It was the first time I’ve seen a whale that close and it stayed on the surface for several minutes. 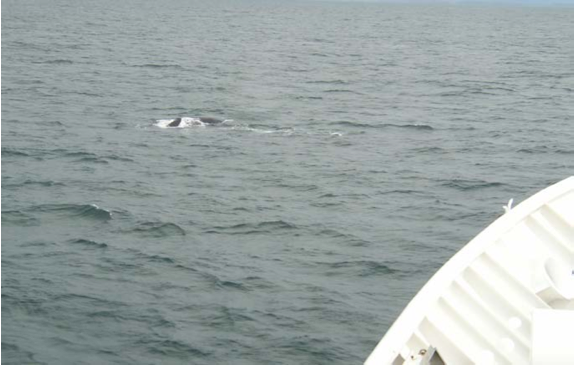 When a whale is spotted, they make an announcement to all hands that a whale is spotted on port side or starboard side. Everyone grabs their cameras to try and get a good picture. I tried too, but I don’t know if it’ll turn out, as they are notoriously hard to film. They move through the water so gracefully and quickly that photographs are hard to come by. As we are moving through an area of straits, the weather is cloudy and foggy, but when the fog lifts, it brings a lovely view of the mountains. I’ll be headed to Homer, Alaska tomorrow for a few days of sightseeing, then home and back to the classroom. What an adventure this has been! Thank you NOAA!! This entry was posted in 2004, Kathy Virdin, NOAA Teacher at Sea and tagged multibeam sonar, noaa ship rainier, shipwreck, whale pass, whales. Bookmark the permalink.